Penetrating, sharp as razor wire wrapped around a bamboo prison compound. Resonant, brimming over with grief, suffering and bitterness — yet transcendent, profoundly humanizing in its poetic homage to a forgotten American hero…. Composer Tom Cipullo’s one-act opera Glory Denied, playing through May 11 as part of Fort Worth Opera’s 2013 Festival, captures the somber essence of Tom Philpott’s 2001 best-selling book of the same name with rhythmic clarity and beauty. 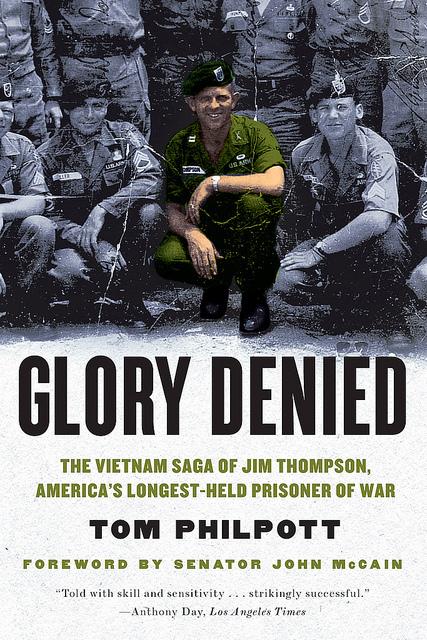 Described by Philpott as a ”searing oral history” of the Vietnam wartime experiences and their destructive aftermath endured by the longest-held American prisoner of war, Ret. 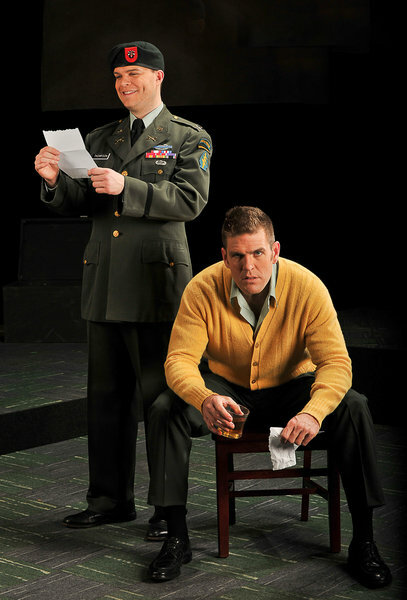 Army Colonel Floyd “Jim” Thompson, the opera juxtaposes realities and time’s passage with four characters strategically placed on the thrust stage. Each emerges from a dedicated corner on the set, dressed with a simple wooden chair, freestanding coat rack and large Army-style green trunk. Jim as a young Army prisoner enduring nine years of torture at the hands of the Vietcong and his young, expectant wife Alyce inhabit upstage platforms, idealized, almost ghost-like visions or projections. Mature Ret. Colonel Thompson rages in booze-laden isolation on the downstage right front platform, as does his counterpart, the mature, embittered Alyce downstage left. Both “went through Hell” those years he was held prisoner, continuing after his return. At center in the playing space stands a plain utilitarian table, a simple connector for the characters: another abyss to reach across, to wail an aria from and to sink beneath in defiant defeat. Chamber-style, a musical ensemble including a harp, visible in shadowy relief, accompanies the singers from behind the platforms, beneath free-floating hanging flats in pastel hues, where sepia-toned projections appear. Ritualistic mirroring of actions in duet or sometimes by the whole quartet establishes the dream-like nature of the work, as though unfolding in the murky memory of older Colonel Thompson. Action, thought and response cascade throughout the work, with no interruption for recitative or spoken dialogue, libretto and score smoothly-integrated. Dean Anthony’s defined, elegant stage direction lends the work an air of tragic gravitas, with each character striving for greater good while struggling valiantly to survive amidst disappointment, betrayal and chaos. His cast of four, as connected to one another as a Greek chorus and as fully engaged as Shakespearean players, imbues the work with raw honesty and savage sorrows. Whether singing solo or in harmonic interplay, each skilled vocalist validates the poetic beauty of Cipullo’s homage to a fallen, forgotten warrior, a true American hero. We Americans have never truly honored those who fought in Vietnam, or those who hoped desperately for their return, nor grieved their losses. Tom Cipullo’s Glory Denied, as performed by Fort Worth Opera under Dean Anthony’s direction, helps to rectify that sad reality. Glory Denied, debuting FW Opera’s “Opera Unbound” series, performs in the McDavid Studio across Calhoun Street from Bass Hall April 27, 30, May 1, 4, 7, 8, 11, 2013.